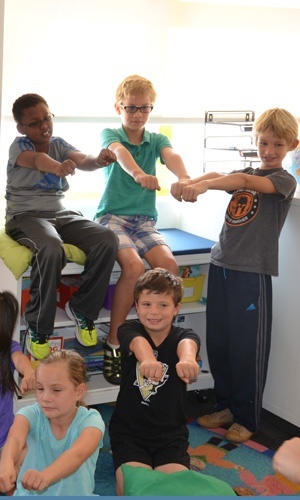 Teacher Melanie Maynarich leads her 3rd graders through “conscious discipline” exercises, teaching them ways to calm themselves down when they are upset or angry. Imagine a classroom full of students. One walks in upset and the teacher rushes to that student’s aid. Now picture another scenario: a student walks in upset and instead of the teacher helping the student, a community of students is recognizing that emotion, and helps the student instead of the teacher. The latter is exactly what happened in my third grade classrooms. Recently the students learned different ways to help them calm down when they’re upset or angry. They practiced four different ways to breathe: Balloon, Drain, Pretzel and be a S.T.A.R. (for Stop, Take a breath, And Relax). We also have a S.T.A.R. Person in each classroom. This job is for a student to recognize when others are upset or angry and to help them breathe and calm down. These few small steps have already taught the students empathy and to be understanding of others. In one room, a student came in upset about a situation that happened at recess. The S.T.A.R Person quickly walked over and asked, “Would you like to balloon, drain, or be a S.T.A.R. ?” The S.T.A.R. Person coached the student through breathing a couple of times and he quickly calmed down. When I asked them how they felt, both answered that having someone recognize that they were upset and then coach through calming them down helped them to think about the situation. When we can help children recognize their own emotions and teach them ways to calm down, it makes for a safer learning environment. 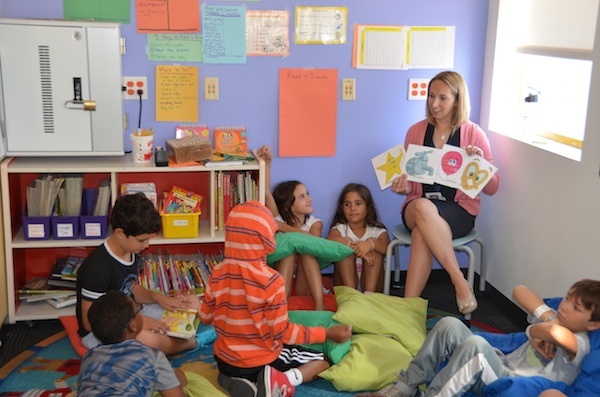 Students begin to learn compassion, empathy, and understanding of each other that leads to stronger relationships and connections with one another. In another class, a similar thing happened. As I was passing through the hall, the S.T.A.R. Person from the other class ran up to me calling, “Guess what I did?! Someone was upset in French class and I helped them calm down!” As I looked from the S.T.A.R. Person to the other student who was upset during class, both had smiles on their faces, and I could tell that already these third graders are beginning to become part of a school family by appreciating and understanding one another. As a teacher, I am recognizing the power of giving students the tools and opportunities to help one another not only when they’re happy, but also when they’re upset or angry. Without teacher prompts, and when given a chance, students can become observant and aware of others. After all, isn’t it better that students are learning appropriate ways to handle their upset instead of having to deal with it on their own? With more practice, discussions and awareness of others, students will be able to start calming themselves down and pass on what they’ve learned to others. If you would like to learn more about this, please refer to Conscious Discipline by Dr. Becky A. Bailey. Don't miss your chance to visit one of ISTP's dynamic classrooms – book a tour today!